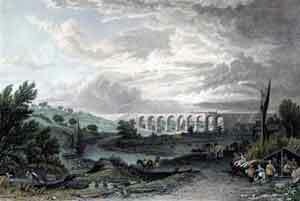 Between 1821 and 1824 the project to build a railway in the North West, between Liverpool and Manchester, was taking shape but in 1825 the Stockton and Darlington Railway opened in the North East and, as a railway primarily built for the purpose of carrying goods, it successfully reduced the cost of carrying coal from 18s 0d to 8s 6d per ton. It quickly became apparent that high profits could be made by building railways. 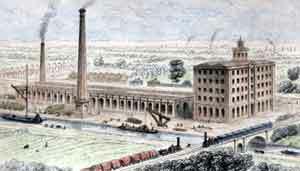 The initiative to build the Liverpool and Manchester Railway came from Joseph Sandars and William James and subsequently, a group of Lancashire businessmen, led by Charles Lawrence, Lister Ellis, Robert Gladstone, John Moss and Joseph Sandars asked George Stephenson to build them a railway between Liverpool and Manchester. The principal aim of the railway was to reduce the costs of carrying raw materials and finished goods between Liverpool, the most important port in the north of England, and Manchester, the centre of the cotton industry. The main difference between the Stockton and Darlington Railway and the Liverpool and Manchester Railway was that from the outset the latter was to carry passengers as well. The proposed Liverpool and Manchester Railway was immediately seen as a threat to the Bridgewater Canal. This canal was making large profits by carrying goods between Liverpool and Manchester. In 1825, shares in the canal company, originally purchased at £70, were selling for £1,250 and paying an annual dividend of £35. 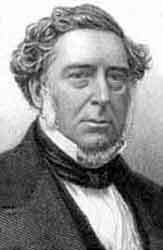 Following the death of Francis Egerton, the Third Duke of Bridgewater, who had financed the construction of the Bridgewater Canal, a Trust was established to manage it. This initially consisted of three Trustees, one of whom was the Superintendent who was given supreme powers in the will of the late duke. It was this Trust, led by the Superintendent, which fought against the proposed railway. Turnpike Trusts, coach companies and farmers also voiced their strong opposition to its construction. 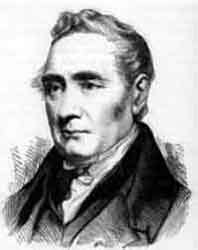 Parliament dismissed George Stephenson's proposed route for the railway and then James Sandars asked George Rennie (1791 - 1866) and John Rennie (1794 - 1874), sons of John Rennie Senior, to carry out a new survey of the line and they were also invited to build it. The brothers appointed Charles Blacker Vignoles (1793 - 1875) as their surveyor. At this juncture, George Stephenson disappeared from this project for a while. He had lost some position in the engineering world and he was embarrassed by making errors in levels. By hard work, he gradually regained his position. 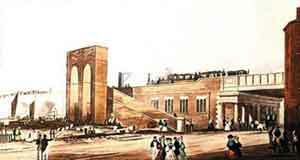 The Act that empowered the Liverpool and Manchester Railway Company to make and maintain a railway between Liverpool and Manchester was passed on the 5 May 1826, 7 George IV Cap XLIX, and it consisted of 200 sections covering practically every aspect of the administration and operation of the new railway that the company was about to build. 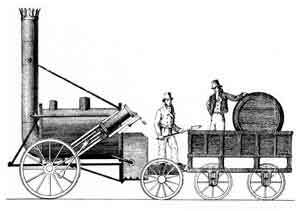 Following George Stephenson's reappearance, he was immediately faced with a large number of difficult engineering problems. These included a two-mile long rock cutting at Olive Mount, the building of a nine-arched viaduct across the Sankey Valley and crossing the unstable peat bog at Chat Moss. The Liverpool and Manchester Railway was 31 miles long and it was built with a double track. The edge rails were of the fish-bellied type secured to stone blocks, later, wooden sleepers. Trains started at Crown Street Station in Liverpool but first they had to be hauled up an inclined plane of 1 in 96 by stationary engines at the top where they were then attached to locomotives for the remainder of their journey to Manchester. The engine houses at Edge Hill were camouflaged by building them into a 'Moorish Arch' and the trains passed below this. At Manchester, the railway line crossed the river Irwell to end on the corner of Water Street and Liverpool Road, where the station became known as Liverpool Road Station. Between Liverpool and Manchester, the railway line passed through, or nearby, Broad Green, Huyton, Prescott, Whiston, Rainhill, Newton-le-Willows, Kenyon, Worsley, Barton, Eccles and Salford. At first, the directors of the Liverpool and Manchester Railway Company were in a quandary about hauling trains either using stationary engines, located at intervals along the line, or locomotives. To assist them in reaching a decision about this dilemma, they decided to hold a competition where the designers of the winning locomotive would be awarded the sum of £500. The idea behind this was that if one of the locomotives was good enough, then it would be the one used on the new railway. The competition, which became know as the Rainhill Trials, was held in October 1829. Each competing locomotive had to haul a load of three times its own weight at a speed of at least 10 miles per hour. They were required to traverse twenty times up and down the track at Rainhill, which made the distance about the same as a return trip between Liverpool and Manchester. The load attached to each engine was to be three times the engine's weight. The judges were three prominent engineers: Nicholas Wood, chief engineer of Killingworth Collieries, John Urpeth of Stourbridge, for his services to the railway, and John Kennedy of Manchester, a wealthy cotton spinner and inventor. The trials began on the 5 October and they ended on the 14 October. 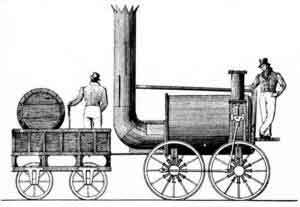 The final three locomotives were Novelty (designed by John Braithwaite and Captain John Ericsson), Sans Pareil (designed by Timothy Hackworth) and Rocket (designed by Robert Stephenson with the aid of Henry Booth). The judges declared that Rocket had won the competition. 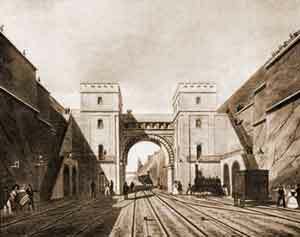 The Liverpool and Manchester Railway was opened on 15 September 1830 in the presence of the Prime Minister, the Duke of Wellington, and a large number of dignitaries. There was a procession of eight locomotives and these were the Northumbrian, Phoenix, North Star, Rocket, Dart, Comet, Arrow and Meteor. 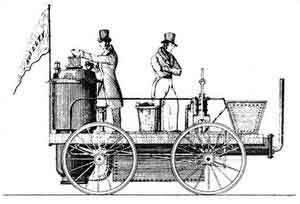 The opening celebrations included giving a number of VIPs a ride behind the Northumbrian and afterwards William Huskisson, a Member of Parliament for Liverpool, crossed from his own carriage to speak to the Duke of Wellington. Warnings were shouted when people realised that Rocket, driven by Joseph Locke, was about to pass the Northumbrian. In spite of these warnings, Huskisson was unable to escape and he was struck down by the Rocket. One of his legs was badly mangled and a doctor attempted to stem the bleeding. George Stephenson then used Northumbrian to take him to Eccles for further treatment but, despite all attempts to save him, Huskisson died later the same day at the Vicarage. Following the accident, large crowds were still assembled along the railway line, so it was decided to continue with the procession. Nevertheless, when the Northumbrian entered Manchester the carriages were pelted with stones thrown by weavers who were aware of the Duke of Wellington's involvement in the Peterloo Massacre and his strong opposition to the the proposed Reform Act (passed in 1832). In spite of such an inauspicious start, the Liverpool and Manchester Railway was an immediate success. In 1831 the railway carried 445,047 passengers. Receipts were £155,702, with profits of £71,098. By 1844, receipts had increased to £258,892, with profits of £136,688. During this period, shareholders were regularly paid out an annual dividend of £10 for every £100 invested. Moorish Arch, Edge Hill, near Liverpool. Sankey Viaduct, near Newton-le-Willows. Bridgewater Foundry, Patricroft. Water Street, Manchester. Carlson, Robert E, 1969. The Liverpool & Manchester Railway Project 1821-1831. Newton Abbot: David & Charles. Donaghy, Thomas J, 1972. Liverpool & Manchester Railway Operations 1831-1845. Newton Abbot: David & Charles.